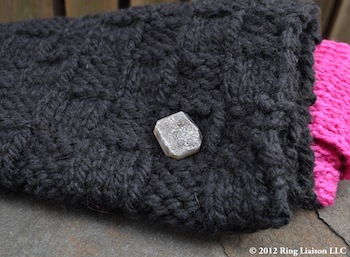 It was only when Stitch Therapy’s Maxcine asked me to write a guest blog post that I realized how much my love of knitting is related to my love of gemstones. 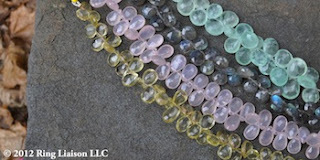 As a gemologist, I have been working with gemstones and diamonds for the past ten years, and as a further outlet for my creativity, I have been working with yarn for the past fifteen. My mother taught me to knit and purl, in what I now know is a variation on the Continental style, but back then I just thought it was the only way to knit. 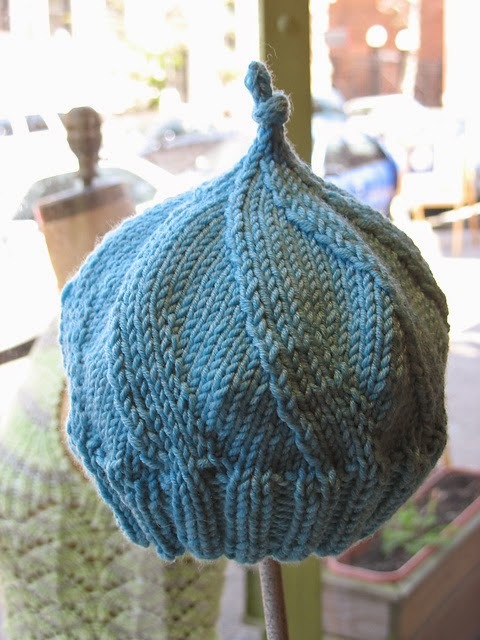 ﻿﻿ ﻿﻿My first skein of yarn was purchased from a farmer at the Union Square Greenmarket here in NYC. It was a gorgeous muted purple wool, derived from the farmer’s beloved sheep back home. It is rare to have such a short distance between knitter and original yarn source. The hands that accepted my crumpled dollars were the same ones that had shorn the sheep whose wool I was using. It is just as rare to purchase a gemstone direct from the source. There are so many people involved in the process of getting a stone from the mine and into a piece of jewelry, and you usually only meet the last person in that chain of work, if at all. Describing the color of that first skein of yarn as a muted purple doesn’t do it justice. It was the enchanting color of an amethyst, rich in hue with a slight blue undertone. Admittedly, one of my favorite parts of both knitting and gemstones is the vast selection of delectable colors – buttery yellows of citrine, soft greens resembling emerald, the deep intense reds of a ruby, the regal dark blues that bring to mind a sapphire. I think about colorful yarns the same way I would a gemstone before it is made into jewelry. What would this raw material be showcased best as - earrings? A scarf? Who will it? Is it for everyday wear, or for special occasions? The thought process is all about creating an end product that will shine and bring joy and happiness through its beauty. Perhaps most importantly, I think it is my appreciation of fine detail that attracts me to yarn and drew me to my profession. My eyes have been trained to look for and see the minutest clarity characteristics in a stone. Similarly, at home I can find myself scrutinizing every yarn stitch. Perhaps that is why I have been known as a tight knitter? I try to make sure every stitch is done correctly, because otherwise I will be sure to see that rogue loop in the finished product. Even if no one else does! It’s amazing to me how much of your knitting style – the looseness of your stitches, the colors you choose, the method of your knits and purls – has everything to do with the rest of your life. 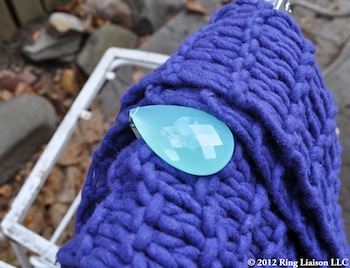 If anything, I think knitting mirrors your ingrained behaviors, emotional state, and best or worst traits. Maxcine has been teaching me a whole new way to knit, and while it is hard to retrain my brain-finger patterns, I think it will make me a quicker and more productive knitter. Who knows what else about my knitting (or my life) might change! Molly Clarke is a gemologist and owns her own business as an engagement ring consultant. Check out her website at http://www.ringliaison.com/. Thanks for taking the time to share your thoughts. Comments are moderated and will be posted after blog owner approval. ... I stopped in about a year ago with the idea I would make a hat for my husband. It was a very busy day and I watched Maxcine's curt manner in dealing with her customers. I mustered up the courage to ask for help and was surprised. She took the time to help me select what I would need and directed me to a website that would teach me the basics. I walked out of there with everything I needed to get started and with minimal damage to my psyche. I was a little intimidated to go back but did. When I returned after completing my hat I left feeling like I could do anything. They were so encouraging and supportive of my finished project. I signed up that day for one of their free knitting circles to learn how to make a mitten. They have helped my pick new projects based on my skill level and what would be a challenge to help me advance my skill. So one year later I have completed a dozen hats, two sweaters, a scarf and mitten. I have learned cables and lace and some basic shaping for my sweaters. ... The owner Maxcine has always been welcoming to me and really helpful with picking out the yarn I need. Maybe people are expecting free lessons and lots of free advice without buying yarn? I would stop getting offended so easily and give her a chance. She's knowledgeable and really good at what she does. 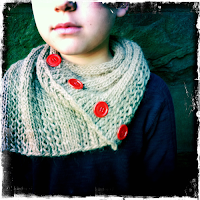 Her yarn is gorgeous and she offers good classes too for people looking for a project. ... The new location on 5th Avenue is very convenient and the yarn selection is great. There are lots of knit/crochet samples to give inspiration too, which is helpful when I want to knit but don't have a particular project in mind. I have always gotten good help and advice here too, even though I can be pretty indecisive about colors and fibers. ... I love this place! I have been a customer since day one and have always been able to find a fantastic selection of yarns to choose from for a project. Note the tag line of the store "a fine yarn store" - so you will not find cheap stuff but it is all high quality. The yarns carried are beautiful and soft. You will find it is easy to work with, priced well for what you are getting and great customer service and support after you have made a purchase. (If you are a beginner, learn to work with good yarn on a small project - it will be more forgiving in the long run). For a store of this size, there is a wide range of patterns, books and tools - if you don't see something, all you have to do is ask. Maxcine is great at making recommendations for substitutions. Maxcine, the owner is warm, friendly, smart, skilled and seeks to encourage a community of knitters that have a place to come to meet each other and build their skill. Maxcine is a fantastic teacher - really knows her stuff! I have to say that my knitting skills have improved tremendously since I have become a customer and I have met some great people as well. I have seen Maxcine take time with new customers and exhibit patience that was unbelievable. One should consider that this is a small store and Maxcine has to cover all roles on a busy day (that includes administrative needs that all small business owners have to endure). So expecting her to give you a 30 minute lesson when you did not buy the yarn or pattern from her is a bit much. Because Maxcine understands the importance of cultivating a customer base, walk in help is always available - whether you purchased from her or not. I highly recommend that you stop in, take some time to browse, meet the owner, take a class and support the place. Make up your own mind about the service. ... There is an integrity to the store that I don't often see, and I think it reflects the proprietary attitude of Maxine, the owner. That's why I was a bit puzzled to read on this site that others aren't of this opinion. Yes, Maxine is a stickler about the quality of the yarns she offers and I don't think she is the kind of person who will carry something just because it will "sell." I think that indicates a respect for the efforts of her customers, who will be spending many hours working on a project. I often see Maxine perusing yarn samples and researching different brands, as well as seeking feedback from her customers. So it's not surprise that the the store is constantly evolving and growing. There is always something new to try out, while trusted core yarns are also available in a different selection of colors from the last season. I find this refreshing, when so many businesses fall back on dusty formulas and become stagnant, or chase trends and lose sight of the basics. I like to touch yarns, and look at pattern books to be inspired, and this is very much encouraged here. Maxine always takes time to find out what you want to work on and I can always trust her to tell me if a yarn she carries may not work for a particular project I have in mind. Any other knitter can always go on-line to find yarns, but the hands-on approach at this store works if you want sound and honest advice. It's good to know that the owner knows her stuff and will share her knowledge and experience with you. In the past, I've been rather intimidated and turned off by the clique-like quality of regulars in other stores. At Stitch Therapy, I've found that the customers are genuinely open and communicative as they are diverse. It certainly helps you feel welcome when the owner makes the extra effort to introduce her customers to each other, whether they are regulars or newcomers. Thanks to Maxine, I've met a number of lovely, creative individuals here and I think that says says something about this store. ... Stitch Therapy is my happy place - and it's all mine. Maxcine is a warm, kind, calm, clear, direct, giving and welcoming person, who also happens to be one of the most knowledgeable and gifted people I know with regard to knitting. I am sometimes what people might call a "difficult client." I am constantly changing pattern gauges, am stubborn, sometimes don't understand what is being explained to me, and am always wanting more and more yarn at reasonable prices. Whichever it is, Maxcine simply smiles and when I'm done, she suggests yarns for my new adventure. There are many times I look for yarn, patterns or tools for well over an hour while I pick her brain. Then I decide to buy nothing. She always welcomes me to sit , chat and knit at my leisure. I, for one, am very grateful that cell phone calls are not allowed in the store - mostly because it keeps the space peaceful. The yarns range in price and if you know yarns, you will quickly realize Maxcine does not carry run-of-the-mill yarns so you are getting a much better quality for your money. And there are always lovely yarns in the sale corner. 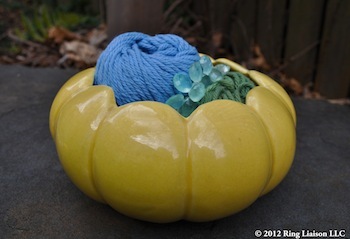 Over the years, and because of Maxcine's introductions, I have become friendly with many Stitch Therapy knitters. It's to the point that when any of us happens to show up on the same day, we have something of a family reunion; the chattering and sharing of projects seems endless. It's a wonderful place to visit, shop and enjoy...the regulars are very warm and no matter how experienced or not we are, we all learn many things from each other. New customers are always welcomed by other knitters because they may become new friends.